When William Bartram traveled through the south from 1773-1776 he observed many environments that today are either extinct or very rare. In southern Alabama just east of Mobile he journeyed through a grove of dogwoods and magnolias that was 9 miles long. This is how he described it. The existence of an almost pure stand of dogwoods this large has long puzzled me. Dogwood is a common understory tree throughout the south but I’m unaware of any natural location where it largely dominates as a canopy species. Recently, I reread the passage, and the next morning I had a eureka moment–I believe passenger pigeon flocks created this unusually large stand of dominant dogwood trees. The dogwood grove Bartram observed was likely the site of a massive passenger pigeon roost 50-100 years before he traveled through it. 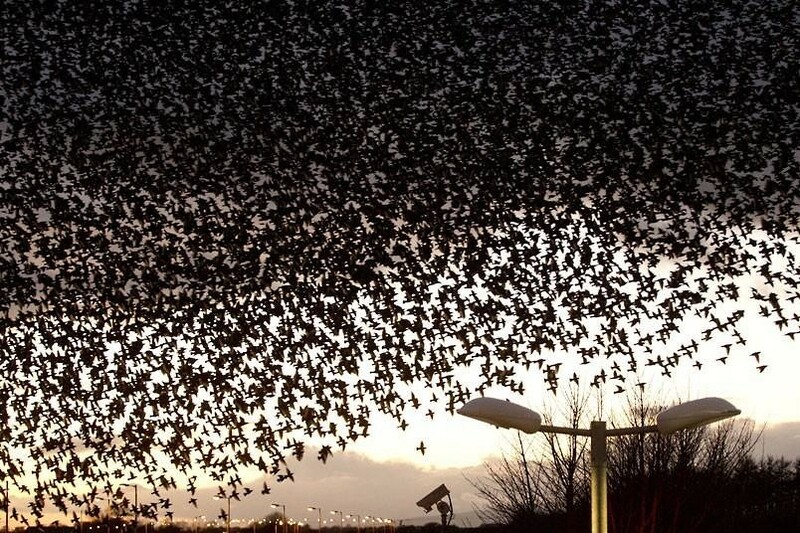 Flocks of migrating passenger pigeons (Ectopistes migratorius) formerly caused eclipses of the sun lasting for 6 hours, and when they roosted their colonies would so damage the forest it would appear as if a tornado had struck. The weight of the roosting birds would bust limbs and even crack enormous tree trunks in half. The dung overfertilized the trees, often killing all of them. These enormous colonies covered many square miles. This explains the extent of Bartram’s dogwood grove. Dogwood trees were already common in the understory of the forest, and the fruit ripens in the fall…exactly when passenger pigeons migrated to the south after nesting in the midwestern states. It seems likely passenger pigeons fed on the dogwood and magnolia berries in the surrounding forest, and deposited the still viable seeds under their roosts in their dung. Dogwood trees sprouted in the nutrient rich soil and thrived in the open sunlight created when the overstory trees were destroyed by the passenger pigeons. Bartram’s dogwood grove was probably located in Conecuh County, Alabama. Passenger pigeon migrations eclipsed the sun. Bartram describes adjacent open plains that also resemble a landscape recovering from a passenger pigeon invasion. 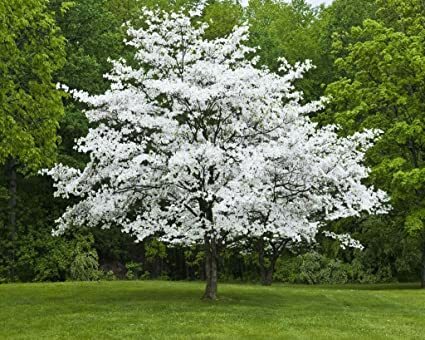 Most of the 70 mile forest surrounding the dogwood grove consisted of oak, hickory, black walnut, elm, sourwood, sweetgum, beech, scarlet maple, buckeye, and black locust with an understory of dogwood, crabapple, and plum. (Chestnut and pine grew on rocky hills.) But some pockets of treeless plains within the forest and alongside the dogwood grove were composed of shrubs covered in grape vines. The shrubs included silver bud, buckeye, bignonia, azalea, and honeysuckle. 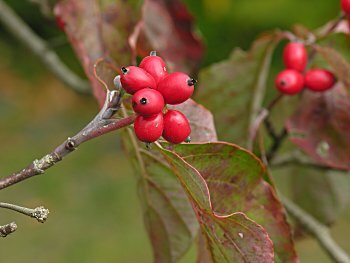 Dogwood berries. Passenger pigeons ate them. They taste bittersweet to me. Flowering dogwood. Bartram’s dogwood grove must have been beautiful during early March when the tree blooms. I’ve always wondered how forests recovered following an invasion of passenger pigeons. It didn’t occur to me until just recently that Bartram had described just such a site, though he was unaware of how the landscape he described originated. In summary I shall list the lines of evidence for my hypothesis that Bartram’s dogwood grove was the result of a massive passenger pigeon roost 50-100 years earlier. The size of the site (9 miles in extent) is the same size as many passenger pigeon roosts described by colonists. Heavily fertilized soils support monocultures. The site, fertilized by pigeon dung, supports just 1 dominant species with 1 minor component. From Bartram’s description all of the dogwood trees appear to be the same age, suggesting they all germinated during the same year. Passenger pigeons arrived in the region when dogwood trees bear fruit. This makes my hypothesis plausible because passenger pigeons are the only species that could have planted dogwood seeds on such a large scale. Adjacent areas also appear to be recovering from a passenger pigeon invasion. Bartram describes pockets of plains where there are no overstory trees, just shade intolerant shrubs covered in grape vines. Activist objections to the use of genetically modified organisms are illogical. Their campaign to have products labeled as containing GMOs is unnecessary and misleading. There is no scientific evidence whatsoever that GMOs are harmful for human consumption. The difference in the chemical composition between a natural organism and a genetically modified one is not significant. Forcing companies to label products as containing GMOs, unfairly hurts sales because of all the ignoramuses who wrongly perceive these products to be harmful. A label or name for a product is a critical marketing attribute. Call a dish cornmeal mush and it’s worth 25 cents; but call it polenta (the exact same thing) and in a fancy restaurant, it’s sold for $25. Some organic farmers complain about pollen from GMOs drifting onto their fields and contaminating their produce. Organic produce is another word for “more expensive” produce. Organic produce is not healthier nor is it superior in quality to any other produce. In fact it’s often worse. If we depended on organic produce for all of our food supply, the human race would rapidly starve to death. The organic produce market is a scam, and I see no reason to shed tears if these crooks can’t have their produce certified as organic. They’ll just have to sell their fruits and vegetables at regular prices. It’s a shame anti-science zealots have tarnished GMOs with such a negative perception. Many developments in this biotechnology are ingenious. For example scientists learned how to take a gene found in wheat and splice it into American chestnut DNA. This gene makes an enzyme that destroys the toxin produced by the blight that wiped out chestnut forests in North America (See: https://markgelbart.wordpress.com/2013/08/25/pleistocene-chestnut-woodlands/). These genetically modified American chestnut trees have greater resistance to the blight than the Chinese chestnuts being used to create resistant hybrids. There are thousands of genetically modified American chestnut trees growing in New York test plots. Researchers are seeking regulatory approval to expand the areas where they can plant these new trees. Permission is expected to be granted soon because they are not asking that the nuts be approved for human consumption. It’s likely that in a few centuries, the American chestnut will once again become a dominant tree in eastern North America, thanks to genetic modification. Genetically modified chestnut tree that is resistant to chestnut blight. Technically, American chestnuts were not extinct. But genetic engineers are attempting to bring back completely extinct organisms. A non-profit organization, known as the Revive and Restore Project, has a whole list of candidates for restoration, including passenger pigeons, Carolina parakeets, red Cuban macaws, ivory-billed woodpeckers, imperial woodpeckers, moas, thylacines, Caribbean monk seals, woolly rhinos, and woolly mammoths. (See: http://longnow.org/revive/candidates/) Currently, they are working on the restoration of the passenger pigeon (See: https://markgelbart.wordpress.com/2010/08/27/pleistocene-passenger-pigeon-populations/). Scientists are studying the genome of the band-tailed pigeon–the passenger pigeon’s closest living relative. And they are studying the genome of the passenger pigeon obtained from the DNA of numerous museum specimens. They are comparing the genomes of both species and are hoping to convert band-tailed pigeon DNA to passenger pigeon DNA. Some day, within our lifetimes, passenger pigeons may once again fly in the America woods. However, I’m doubtful they will be able to successfully re-establish themselves. In order to survive this species required the existence of very large colonies, and a few dozen birds released back into the wild would probably get eaten by predators within a few weeks. Band-tailed pigeon. It’s the closest living relative to the extinct passenger pigeon. 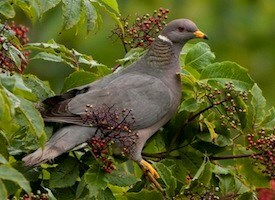 Scientists believe they can re-create the passenger pigeon from the band-tailed pigeon genome. Scientists speculate the technology needed to bring woolly mammoths back to life is at least 50 years away. With today’s technology, DNA from a woolly mammoth would have to be implanted in 1000 elephant eggs to have a chance of 1 viable mammoth offspring. Elephants are too rare to obtain this many eggs. However, some day scientists should be able to reprogram good quality cells found from mammoth specimens recovered from Siberian permafrost into stem cells that can then be used to clone a mammoth. Woolly mammoth. I’m afraid we won’t see a live one in our lifetimes. But maybe our children or grandchildren will. Arguments against bringing back extinct organisms are nonsensical. Some say humans shouldn’t play God. Humans already play God by completely modifying every environment on earth. Everything man does alters the earth in some way. Others see a Jurassic Park scenario. That movie was ridiculous. A few men with high powered rifles could annihilate an army of dinosaurs in a few minutes. None of the candidate species pose any threat to man and would only enrich our now impoverished ecosystems. Some specimens excavated from the Little Kettle Creek fossil site in Wilkes County, Georgia suggest a climate phase at the time of their deposition similar to the present day climate of the Kentucky Bluegrass Country. https://markgelbart.wordpress.com/2011/03/17/little-kettle-creek-the-only-pleistocene-fossil-site-in-the-piedmont-region-of-southeastern-north-america/ Bog lemmings reach their present day southern range limit in northern Kentucky, and red backed voles occur in cool north facing slopes of the southern Appalachians. Yet, both of these species lived in central Georgia during some portion of the last Ice Age. Moreover, evidence from catfish bones also implies much harsher winters than are known in Georgia today. Rural areas of the Kentucky Bluegrass Country, particularly horse pastures with centuries old trees growing in them, are considered relics of the kind of savannah woodlands that predominated in southeastern North America during much of the Pleistocene. Accordingly, this intriguing similarity between the present day Bluegrass Country and Pleistocene central Georgia inspired my research for this blog entry. However, there are some important differences between the 2 regions. Map of the Kentucky Bluegrass Country. The present day climate here is a close analogue to some climate phases of the Ice Age in central Georgia. The geology of the Kentucky Bluegrass Country causes a differing soil chemistry from that found in most of Georgia. The inner bluegrass region rests on top of ancient limestone, making the soil basal while most of Georgia’s soil is acid. The limestone orginated from Paleozoic Age coral reefs that ringed islands resembling those of the modern day Bahamas. Over time geological processes turned all that coral into limestone. The underlying limestone makes the soil of the bluegrass region among the richest in the world. The soil is high in calcium and other minerals that help plants grow and the animals that eat these nutritious plants are healthier than those from other regions, explaining why this is good land for raising horses. Most of Georgia’s soil was never nearly this fertile, even before agriculture wore out the land. The underling rock in the outer bluegrass region is shale. Shale is merely fossilized mud. Note the spectacular 400 year old bur oak in the top left photo. Bur oak is a characteristic species of the Kentucky bluegrass country. I tried in vain to find as impressive a photo on google images, so I ripped this one off from the below referenced book. Note the stand of giant bamboo cane in the bottom right photo. Cane is a relic today, but at the time of European settlement it formed thickets that were as much as 20 miles long adjacent to streams and rivers. Daniel Boone escaped from Indian captivity by running into one of these canebrakes. 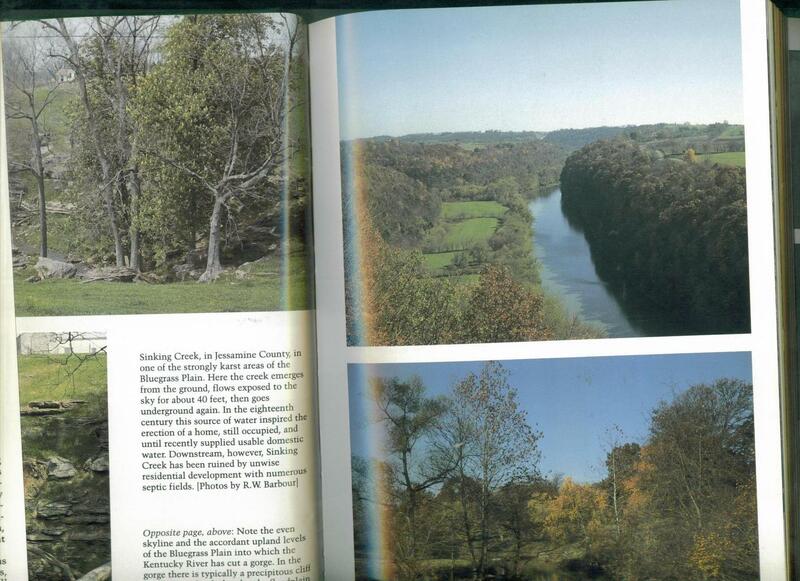 The photo in the upper right corner is a typical feature of the Kentucky river with a steep bluff on one side and a floodplain on the other. The photo in the upper left corner is of a spring that emerges above ground and seeps back underground. The calcium rich soil fosters the growth of calciphiles–plants that grow best in this type of earth. Pre-settlement forests consisted of sugar maple, black walnut, butternut, blue ash, white ash, Kentucky coffee tree, honey locust, black cherry, bur oak, chinquapin oak, Shumard’s oak, white oak, shellbark hickory, buckeye, hackberry, and mulberry. Common undergrowth trees included great stands of pawpaw, crabapple, hazelnut, plum, twinleaf, blue cohosh, and slippery elm. Many of these species are shade intolerant, and they grew in natural widely spaced groves similar to those described by William Bartram from his travels through Georgia in the 18th century. The trees grew far enough apart to allow sunlight to reach the ground, allowing a wide variety of grasses and herbs to flourish. A few of the common species found in the pre-settlement savannah woodlands were buffalo grass (Panicum sp. ), the now endangered buffalo clover (Trifolium stoloniferum), wild rye (Elymus villosus and virginica, not the European grain), wild peavine (Amphicarpa bractenta), the edible wild bean (Phaeseolus polystachios), goldenrod (Solidago sphacelata), and many calcium-loving ferns, sedges, and wild flowers. Giant bamboo cane (Arundinaria gigantea) grew in thick stands along streams and rivers. One stand of bamboo was estimated to be 20 square miles in extent. The Kentucky River washes away some of the rich soil on the floodplain, resulting in thinner, poorer soils along its margin. This area sported a somewhat different composition of trees that included sycamore, white oak, elm, and tulip with an undergrowth of dogwood. Red cedar, now a more common tree in second growth forests here, grew on rocky bluffs. European settlers rapidly destroyed much of this beautiful environment. They cut down most of the trees and converted most of the rich cane land into pasture. 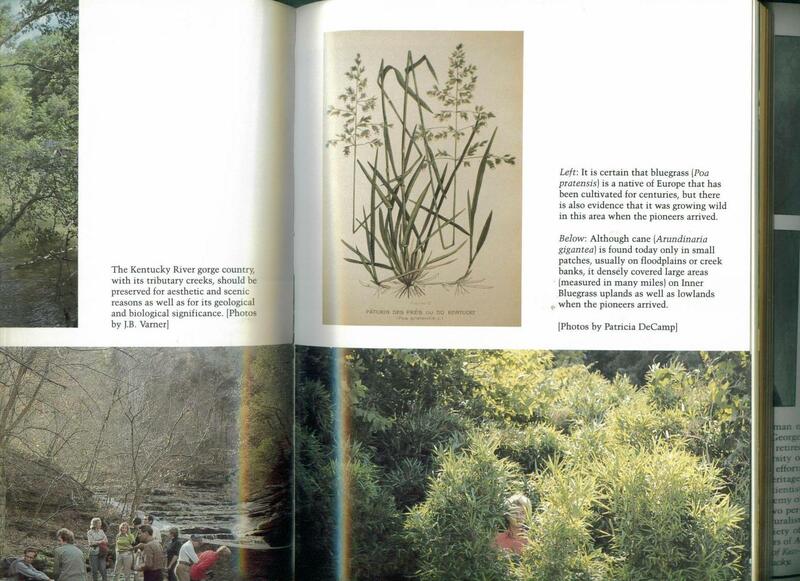 They introduced species of grasses and herbs that outcompeted native plants. They killed most of the sugar maple trees by cutting big chunks out of the trees to harvest the sap instead of carefully tapping the trees in a way that would keep them alive. They allowed their livestock to overgraze between the trees, eliminating regenerating trees, reducing pawpaw stands, and wiping out hazlenut, so that the latter is completely absent from the region today. 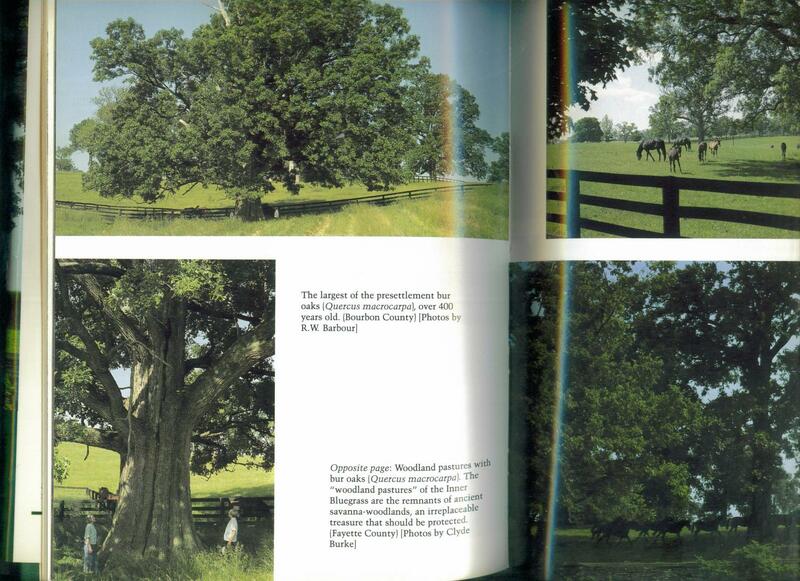 However, many of the bluegrass pastures host ancient pre-settlement trees that are still standing. A 400 year old bur oak still lives in Bourbon County. Other pastures consist of groves of blue ash, bur oak, and Kentucky coffee trees ranging in age between 200-400 years old. The pastures are remnants of savannah woodlands. Mowing is preventing regeneration and eventually these old trees will die. For this reason these relics are endangered. Botanists are uncertain whether Poa pratensis, the species of bluegrass for which this region gets its name, is a native or an introduced species. Bluegrass is also known as English grass, and it ranges into Eurasia and select areas of the Rocky Mountains. The first settlers reported seeing bluegrass growing in Kentucky in the mid 18th century, and there is no ship’s record of it being imported that early. This species may have had a natural Holarctic range, meaning that millions of years ago it spread across the Bering landbridge. Ecologists think the trampling and grazing of great herds of bison and elk shaped the savannah woodland environment here, and that fire was rather infrequent. The rich land and abundant mineral licks attracted unusually large numbers of ungulates to this area. The bison, elk, deer, bear, and passenger pigeons kept tree saplings naturally thinned, fostering the growth of widely spaced trees. Fire must have occurred only rarely because sugar maple (a fire intolerant species) was formerly common here. This ancient savannah woodland environment originated during the Pleistocene, though the plant and animal composition varied, depending upon the climate phase. During interstadials and interglacials when deciduous trees were abundant, mastodons, giant ground sloths, deer, and long-nosed peccary thrived. Both honey locust and Kentucky coffee trees bear leguminous pods that mastodons would have spread across the landscape in their dung. Perhaps their abundance here along with pawpaws is evidence that mastodons made their last stand in the bluegrass country. The radiocarbon date from the fossils found here was ~13,000 BP which translates to ~15,000 calender years BP. The faunal composition suggests a prairie environment with fingers of boreal forests consisting of pine, spruce, birch, and northern hardwoods. Superficially, it would have resembled the lowlands of the present day Yellowstone National Park in appearance. Obviously, the preponderance of species that prefer (or preferred in the case of extinct species) open spaces indicates the fossils were deposited during the Last Glacial Maximum when hardwood forests were on the wane and grasslands were expanded because of the cooler drier climate. The Welsh Cave site is the southeasternmost known occurrence of the grizzly bear. 13-lined ground squirrels lived in Kentucky until as recently as 600 AD. Their remains have been found in Indian middens dating to then. –A passenger pigeon roosting site in 18th century Shelbyville, Kentucky was estimated to be 120 square miles in extent. –The Kentucky River, a tributary of the Ohio River, once was home to a freshwater species of cod, now restricted to more northerly localities. The American burbot, also known as the eel pout, is called the “poor man’s lobster.” Along with 2 species of sturgeon and the paddlefish, it’s been eliminated from Kentucky’s waters. The abundance of Pleistocene fossil sites in Florida has allowed the university in Gainesville to become a center of information for other scientists. Scientists excavating new fossil sites use existing fossils at the University of Florida Museum of Natural History to help identify the new specimens they pull from the earth. It’s not always easy to differentiate closely related species–the subject of this blog entry, the canids, are notoriously difficult to distinguish. Vertebrate zoologists and paleontologists measure and describe every part of every bone and tooth when examining new specimens. They publish this information in scientific journals and accumulate knowledge of the size limits and shape variations of a particular species’ anatomy. If a newly discovered fossil tooth for example doesn’t fit any known pattern of shape or size, than scientists suspect they may have discovered a new species. The more data scientists have, the better able they are to identify new species and spot evolutionary trends over time within a species. Fossil collecting is popular in Florida, thanks to all the sinkhole lakes and caves with basal chemistry in the soil that preserves bones. Amateur fossil collectors have many more fossils in their collections than the University of Florida’s Natural History Museum.. Many are for sale as well. It would be a great benefit to science, if collectors made arrangements to donate their collections to the museum upon their deaths. Many valuable specimens have been lost when their owners die and family members, not interested in the subject, lose track of where they put the old bones. My little study is limited to canid fossils listed on the University of Florida database and leaves out the great many more in the hands of amateur fossil collectors. I also limited this survey to the Rancholabrean Land Mammal Age (300,000 BP-11,000 BP), leaving out Armbruster’s wolf which dominated the middle Pleistocene before being replaced by dire wolves. Nevertheless, I think there’s enough information to suggest relative canid species abundance during the late Pleistocene. Keep in mind, I was counting on a computer screen while scrolling down, so my numbers may be off slightly. Listed on the Florida Museum of Natural History’s database, I counted 64 dire wolf (Canis dirus) specimens, 34 coyote (Canis latrans) specimens, 1 red wolf (Canis niger) specimen, 9 domestic dog (Canis familiaris) specimens, 0 dhole (Cuon alpinus) specimens, and 55 gray fox (Urocyon cineorgenteus) specimens. The fossil record strongly suggests that from 300,000 BP to about 11,000 BP dire wolves were by far the most common large canid being about twice as abundant as coyotes. Red wolves were rare but present. Gray foxes were just as common during the Pleistocene as they are today. These neat little foxes have the ability to climb trees, a skill that saves them from their larger relatives. There is no evidence of dholes but as I wrote in a previous blog entry http://markgelbart.wordpress.com/2011/06/01/did-the-dhole-cuon-alpinus-range-into-southeastern-north-america-during-the-pleistocene/ , I suspect they may have periodically colonized parts of the southeast but in numbers too low to leave fossil evidence. Dire wolves were the dominant large canid in the southeast (and all across North America south of the Ice Sheets) during the late Pleistocene. Coyotes probably occupied a niche similar to African jackals. Gray foxes thrived in areas where they had access to trees and could escape larger predators. The presence of domesticated dogs in the Pleistocene fossil record puzzled and surprised me. I almost didn’t even do a database search for Canis familiaris and only did so as an afterthought. Most anthropologists don’t think humans domesticated dogs until after the Pleistocene about 10,000 years ago, but the fossil evidence contradicts this. In fact scientists recently discovered the skull of a domesticated dog in a Siberian cave that dates to 33,000 BP. They determined this particular domesticated dog was not the ancestor of the lineage that led to today’s dogs but instead its descendents died out. It’s probable that there were many early lineages of domesticated dogs that ceased to exist for various reasons. Perhaps that group of people died out or stopped keeping dogs. The popular idea that people domesticated dogs by kidnapping and raising wolf pups is a misconception. Scientists think it’s the other way around–dogs adopted us. Dogs are descended from the wolves which had the least flight response. Wolves that hung closely around human campsites for access to leftovers gave birth to pups with floppy ears, multi-colored coats, and other dog traits that differentiate them from other wolves. The gene for tameness shares a pathway with the gene for these physical characteristics. So it’s likely that dogs adopted people in many different geographic locations wherever wolves (Canis lupus) began occupying areas adjacent to human campsites. Obviously, dogs either followed or were brought to Florida by the Paleo-Indians. The authors of a chapter in the book The First Floridians and the Last Mastodons suggest that all the coyote fossils found in Florida are actually domesticated dog fossils, but they only knew of a handful of coyote fossils. Apparently, they didn’t know 34 specimens had been found. I doubt scientists made that many misidentifications. Dire wolves succeeded in becoming one of the dominant predators in the environments of southeastern North America where they found a wealth of prey roaming the open woodlands and savannahs. Everything from bison and horses to deer and rabbits sustained them, and a mammoth or mastodon that died of natural causes provided a feast. Coyotes successfully co-existed with dire wolves by scavenging large predator kills and by hunting rodents. Red wolves must have been restricted to islands and perhaps deeply wooded swamps where they could survive on deer and small game. Their niche must have been areas with lower densities of prey as opposed to grasslands that hosted large herds of ungulates. Following the extinction of the megafauna and dire wolves, forests replaced grasslands and red wolves increased in number and drove coyotes completely out of the south. But after European settlers wiped out the red wolves, coyotes returned. I attended my nephew’s bar mitzvah in Dunwoody, Georgia last weekend. Dunwoody consists of dozens of subdivisions and plenty of shopping centers and absolutely no rural farmland. I didn’t hold out much hope for a nice nature walk here–the traffic is terrible. But at least the developers left a lot of trees standing. I decided to walk from my sister’s house to a little park known as the Dunwoody Nature Center and I discovered a surprising gem. This white oak was about 4 feet in diameter. 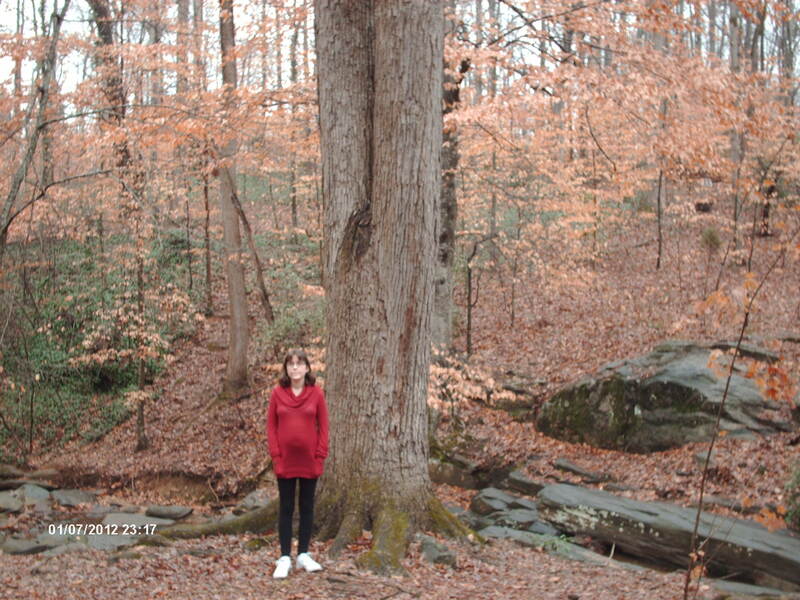 White oak is a common tree in Dunwoody. From the composition of the trees left standing most of Dunwoody must have once hosted a pretty nice dry upland forest. Too bad developers converted it into a crowded suburb. Today, white oaks, black oaks, southern red oaks, shortleaf pines, and loblolly pines are the dominant trees. The Dunwoody Nature Center slopes sharply down toward Wildcat Creek, the name of which is a relic to its former status as a wilderness. 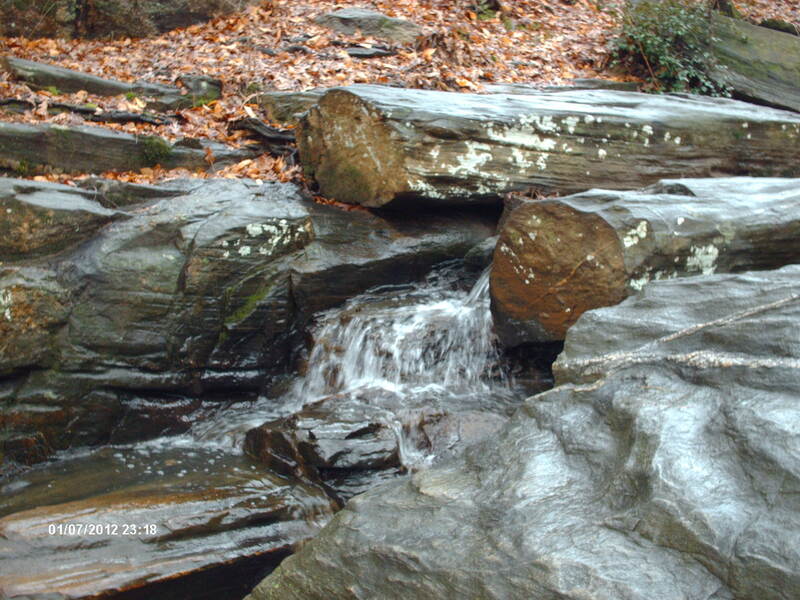 The woods here are dominated by beech, white oak, sweetgum, river birch, and loblolly pine. I was stunned to see a woodlot of mostly beech trees in central Georgia. 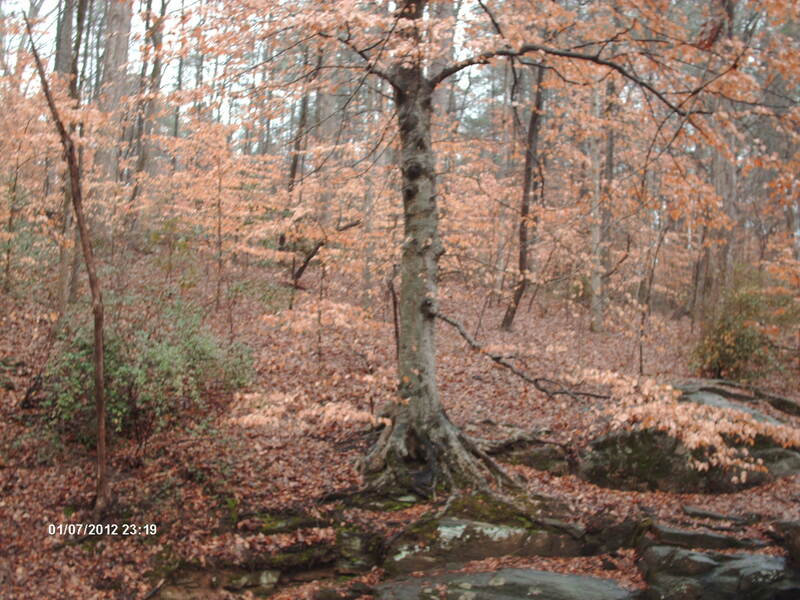 A mature beech tree growing on the edge of a rocky creek. It’s surrounded by many immature beech saplings. Fossil pollen studies show beech was a common tree in the south during the end of the Ice Age when the Laurentide glacier began melting and releasing more moisture in the atmosphere creating a climate that was still cool but more rainy than it was during the height of the Ice Age. The presence of abundant beech in the fossil record is indirect evidence of massive flocks of passenger pigeons. Passenger pigeons fed on acorns–in some places completely eliminating the oak seed crop…and the beech’s competition. Although beech trees produce an edible nut, they can also spread from roots and could survive their seed being consumed by passenger pigeon flocks. Since the passenger pigeon’s demise, oak forests have been replacing beech forests in many areas. So I was delighted to see this remnant beech forest in central Georgia. Wildcat Creek flows through a granite outcropping. Here is a miniature waterfall. Two little league baseball fields take up about half the space of the park. The park is heavily used by dog and toddler walkers. It’s popularity shows that the planning commission in charge of developing Dunwoody should have arranged for the purchase of more land for more parks.